Frittatas make for a delicious supper, somehow more formal and less thrown together than scrambled eggs. Once you’ve mastered the basic frittata method, the variations are up to you. Substitute a heaping 1/2 cup crumbled goat cheese for the potatoes. Or, instead of the green onions, add 1/2 cup diced bacon or pancetta, fried and drained. Other good frittata fillers include fresh herbs, diced ham, and roasted asparagus. You may like more cheese, too. Boil potatoes in lightly salted water until just tender, or until you can easily insert a paring knife into one, about 10 minutes. Drain. When cool enough to handle, cut into very thin slices, about ⅛-inch to ¼-inch thick. Set aside. In a small pan over medium-low heat, melt 1 tablespoon of the butter. When the butter foams, add the green onions, and sauté until they wilt, but are still bright green. Scrape the onions onto a plate to cool. Set aside. Set a 10-inch nonstick skillet with a heat-proof handle over medium-low heat. Lightly beat eggs in a mixing bowl with salt, pepper, and Parmesan. Add potatoes and green onions and stir gently to mix. Add remaining 2 tablespoons butter to the skillet. When it foams, add the egg mixture and shake the pan gently until the mixture lies evenly in the pan. Turn heat to low. Once the edges and the bottom of the frittata have set, and only the center is runny, run the pan under the broiler until the eggs are just set. 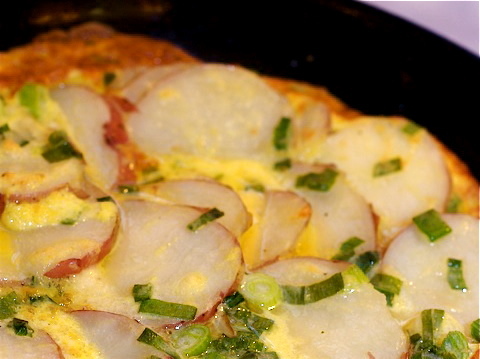 Immediately slide the frittata out of the pan and serve. This recipe serves 4 for dinner, or 6 as an appetizer. If you are using a skillet for the frittata that is not nonstick, use 2 tablespoons more butter. Culinate editor's notes: You can halve this recipe to serve just two people a light breakfast or lunch; the resulting frittata will be thinner and cook faster. If you're trying to stretch your eggs, a splash of milk in the egg better will help. Boil and cool the potatoes ahead of time and the final frittata assembly becomes much quicker. Sliced tomatoes are also tasty layered atop the frittata. Be sure to check out Kelly Myers' explanation of the confusing world of egg labels.